A favorite for every chocolate giving holiday since 1946, Watson’s sells a variety of small batch made confections including dark, white, milk and orange chocolate. But, none are more delicious than the infamous chocolate-dipped sponge. 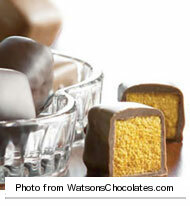 Marketed as “famous round’ the world,” Watson’s Sponge is crispy and fresh. Each batch is kept small to protect freshness and quality control- something that separates Watson’s from every other Chocolatier out there. On any trip to visit family out of town, I always bring along Watson’s Milk Chocolate Sponge because nothing is better, than the original. The story is one I remember being told to me as a child by my Nana, like something out of a fairytale book. A mother, in desperation for a new dish to feed her son’s hungry guests tossed together all that she had: chicken wing parts, spices and sauces to create a dish that Buffalo has now become famous for. This woman’s name was Teressa Bellissimo which in Italian translates to “beautiful very much”- and oh, what a beautiful thing these gigantic wings are. While some Buffalonians would argue that others do it better, I maintain that you haven’t had wings until you’ve had this Anchor Bar original. 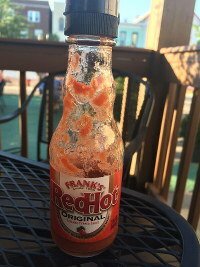 It’s tagline could not be more accurate- Franks, “I put that on everything.” It’s good on wings, in dip, in salad dressing and sauces; and with all the newest flavors available, Franks Hot Sauce has been expanded to suit a variety of new tastes and recipes. 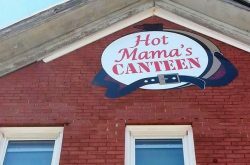 A mild, tangy sauce made of cayenne peppers, Franks comes in Original, Hot, Xtra Hot, Chili-Lime, Sweet Chili, Kickin’ BBQ and NEW Bollywood and Slammin’ Sirracha. Available across Buffalo and across the country, I can find no reason to not pick up a bottle today! 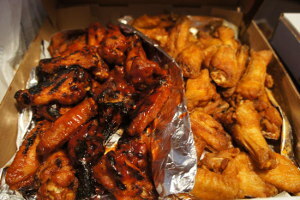 Chiavetta’s chicken BBQ has been famous around Buffalo for over 50 years. There is rarely an event that I attend without the delicious scent and flavor of Chiavetta’s Chicken far away. 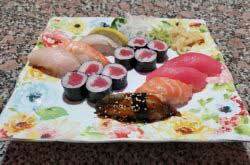 They cater weddings, school functions, and picnics. 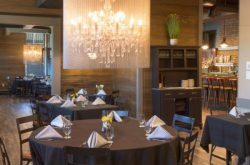 Chiavetta’s is also special as they offer a fundraising set-up to help support their local business and raise money for a cause you find important simultaneously. Recently, I’ve also noticed their own line of sauces and dressings creeping into all the local supermarkets. If you’re not from Buffalo, it’s a guaranteed winner right off the plane. 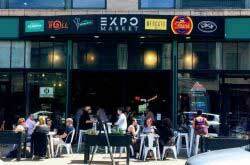 If you’re from Buffalo and haven’t tried it yet, what have you been waiting for? Sahlen’s mantra, “More than hotdogs, sausages and deli-meat” could not be truer. Sahlen’s is THE hotdog of Buffalo and to date, the tastiest that I’ve tried. Clearly I’m not alone as Sahlen’s is the official hotdog of local sports teams, the Buffalo Sabres, Buffalo Bills, and Buffalo Bisons. Also available at the local store for the home chef or BBQ Queen or King, Sahlen’s can be found at every local hotdog sale in Buffalo. 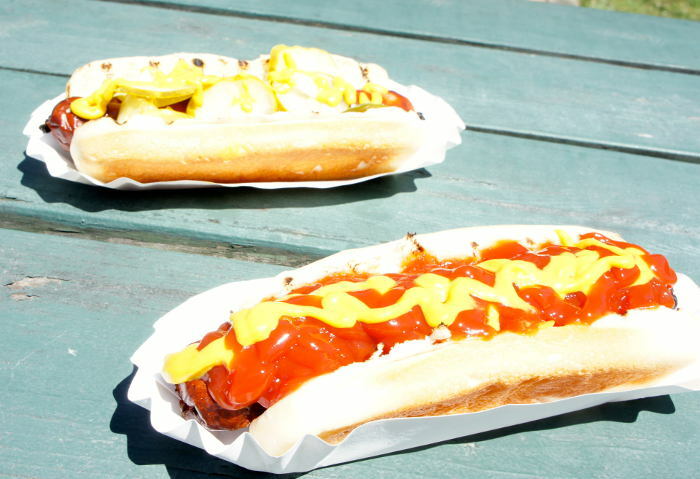 There’s nothing quite like a sweet Sahlen’s frank topped off with delicious condiments and paired with a nice cool drink on a (hopefully) hot Buffalo day. Anytime a non-Buffalonian visits, I always talk them into trying a cool glass of loganberry. A strange mix of sweet blackberry and raspberry flavors, this caffeine free, non-carbonated “soda” is mixed into everything in Buffalo. I’ve had Loganberry syrups, shakes, malts, and gravies and loved every minute of it. I even make a mean Duck l’Loganberry (and no, I’m not kidding). While actually developed in Southern Ontario at Crystal Beach, Loganberry has been adopted and accepted by Buffalo for years. It will continue to be enjoyed for generations to come. 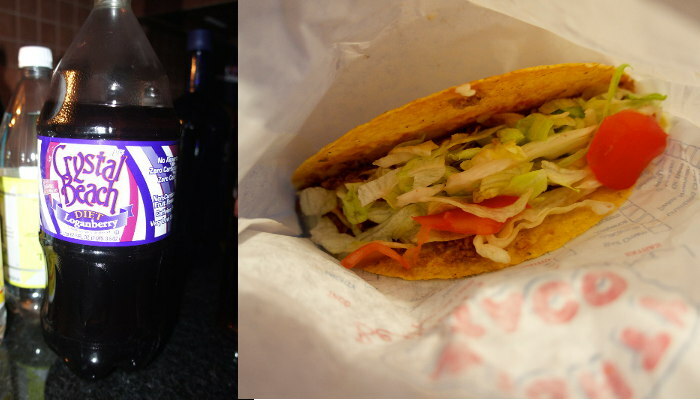 Locally owned and operated, Mighty Taco is a delicacy enjoyed by the majority of folks who call Buffalo home. 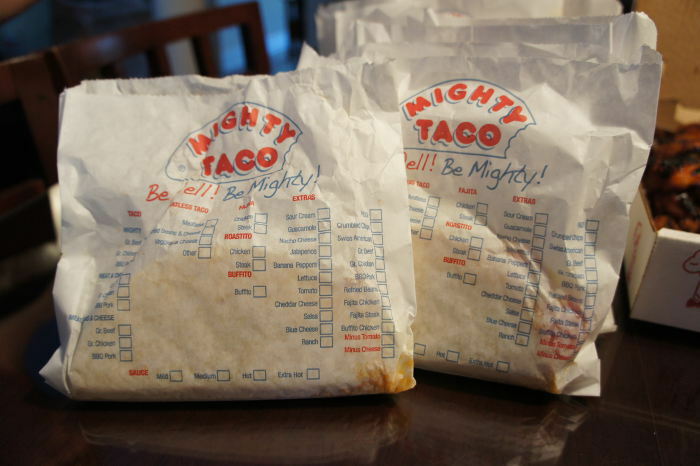 Around since the early seventies, Mighty Taco sells a variety of Mexican creations including its star, “Mighty Taco” filled with meat, cheese, lettuce, tomato and special sauce. 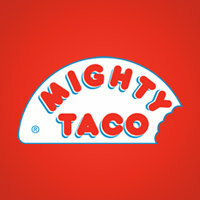 “Mighty” as it’s affectionately known, is also famous for its more creative menu options including its “Buffito” (a Buffalo Chicken filled burrito with bleu cheese dressing) and its more recent addition, the “Carne-alotta” (a burrito stuffed with five kinds of meat and hopefully an included artery de-clogging device). While in the area, keep special watch for Mighty Taco’s hand designed tray-liners which feature local Buffalo attractions and a series of Mighty radio spots, which sometimes comically masquerade as other commercials.